Anyone who has visited Guadalajara recently was probably bombarded with billboards and bar menus touting the latest tequila trend: “Cristalinos”. These are aged tequilas that have been filtered to remove any color added by the barrel during the aging process, leaving the tequila “crystal clear”, like a blanco. Most of the cristalinos that have entered the market so far are clear añejos, advertised as high-end and elegant, with a heftier price tag compared to normal añejos. Probably the most well known cristalinos are Don Julio 70 and Maestro Dobel Diamante, but the market has been quickly expanding to include brands such as San Matias Cristal, Herradura Ultra, Revolucion Añejo Cristalino, and Volcán De Mi Tierra Añejo Cristalino. And, clear reposados are even starting to emerge. In fact, the Tequila Matchmaker database currently lists 44 different cristalinos, with more on the way. Take a look at this full list of all cristalino tequilas, from the Tequila Matchmaker database. As traditional tequila drinkers we’ve often wondered why someone would go through the effort (and expense) to age a spirit, only to filter out some of the aging attributes afterward, so we set out to get some answers. But first, let’s get to the how. How are aged tequilas made clear? If filtering an aged tequila removes the color, won’t it also remove aromas and flavors? Only if you don’t do it right, according to Master Distiller and Blender Ana María Romero Mena. Filtering only the color and leaving the aromatic characteristics of the barrel is “an art,” she says. She knows this first hand, since Louis Vuitton Moët Hennessy recently hired her to develop the flavor profile of their new Volcán de Mi Tierra tequila line, which includes a cristalino. “It will depend on the amount (of carbon) applied per liter and the contact time, so that you can eliminate the color and leave aromas such as vanilla, caramel, maple, chocolate, and coconut, which are obtained through barrel storage,” she says. However, if too much carbon is used, or exposure is too long, aromas can be removed. What happens if the aromas and flavors are stripped out? Unfortunately, many cristalino brands have not mastered the art of creating a clear, but still naturally aromatic, aged tequila. Most have been overly filtered, so that all of the color (and nearly all of the flavor) have been removed, resulting in a neutral product. In these cases, producers will often use additives to create a flavor profile*. Of course, it’s hard to get anyone on the record to admit this, but we sampled Herencia Historico Extra Añejo (5 year) against the same tequila made into a cristalino. The original extra añejo is full of barrel flavors such as caramel, oak and vanilla, with a rounded mouthfeel. The cristalino version is watery in the mouth with little flavor, and an astringent finish. We also tried Tierra Noble Reposado, against the cristalino version. The repo is pleasant with light barrel flavors, while the cristalino version has a very strong eucalyptus flavor. Volcán De Mi Tierra Añejo Cristalino, however, is able to retain aromas and flavors of the barrel. If you look closely, you’ll see the reason why. It still retains a slight tint of color. We also tried San Matias Cristal, which is absolutely clear. The aroma is dominated by vanilla and cake batter aromas, and the flavor is overwhelmingly vanilla and sweet. How does filtering affect mouthfeel? “If the elimination of the color is done in the right amount, it should be silky, since the barrel produces esterification,” says Romero Mena. “(Esterification) must be respected in this process,” she adds. Indeed, in the cristalinos we sampled, the mouthfeel was lighter. 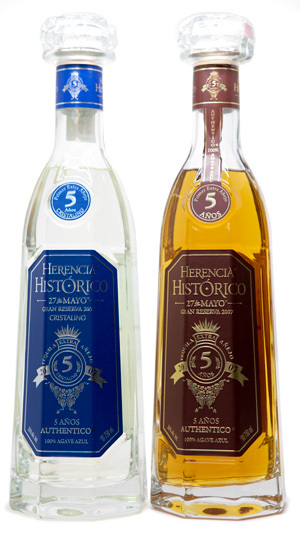 Some brands water down their cristalino version (the Herencia Historico cristalino was 35% abv, versus 38% in the original), but even the samples at the same proof had a lighter mouthfeel overall. 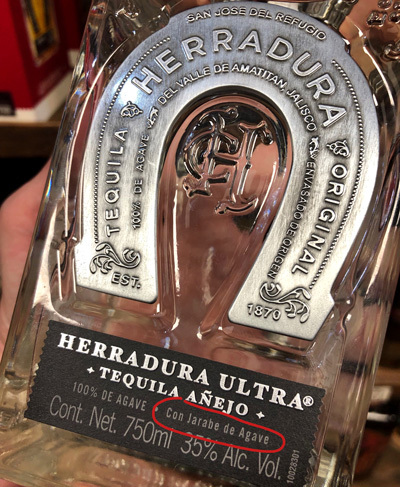 Herradura Ultra goes one step further in altering the cristalino by adding agave syrup to make it sweeter and more appealing to non-traditional tequila drinkers. So, now that we’ve walked you through how cristalinos are made, the question remains: Why? A big part is marketing. Clear añejos represent something new and a little “showy.” There is always a market for this type of product, and it works particularly well in Mexico, where consumers like to bring a fancy, expensive-looking bottle to parties and frankly aren’t as nerdy in general about tequila as their U.S. counterparts. “It’s the fashion right now,” says Emilio Ferreira Ruiz, owner of the El Buho tequila store in Tlaquepaque, Jalisco, who has recently seen a surge in Mexican customers looking for cristalinos. Zack Romaya, owner of Old Town Tequila in San Diego, CA, agrees, saying he has seen growing demand for cristalinos over the last year, with Don Julio 70 as the most requested. Despite the demand, Ferreira Ruiz notes that many of his customers don’t know exactly what cristalinos are. Fifty percent of customers who ask him for cristalinos think they are blancos with stronger agave flavors, and don’t realize they are aged, he says. So, in this way, cristalinos could be causing some confusion around categories. That’s why we appreciated the fact that Volcán De Mi Tierra Cristalino has a light golden color, making it visually different from a blanco. The remaining color also indicates it is not over filtered. Interestingly, Ferreira Ruiz says that he when he provides taste-test samples to customers in his store to compare the traditionally aged tequila against the cristalino from the same brand, they usually buy the traditional añejo, even if they came in looking for the cristalino. For Romero Mena, however, cristalinos are a great choice for beginning tequila drinkers because they are not too spicy or strong. “It’s like when we start learning about wine” says Romero Meno, who is also a sommelier. She admits, however, that the target market is not for connoisseurs of tequila. “There are educated palates who are against removing what has been achieved with aging,” she says. When we dig into more user ratings we see that Don Julio 70 has an average community rating of 83, while the original Don Julio Añejo has a slightly higher community rating of 84. 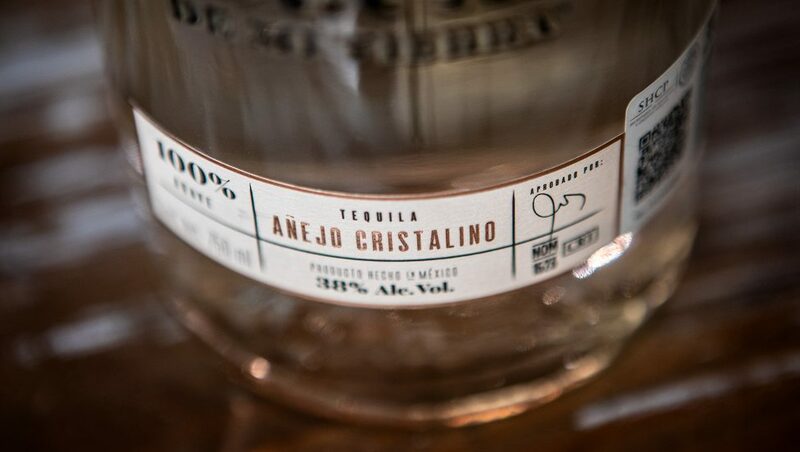 The bigger difference comes from our tequila panel members—more experienced drinkers— who gave Don Julio’s cristalino an average score of 70, versus 81 for the non-filtered añejo. In general, cristalino products are more expensive. Our pricing research shows that consumers in Mexico are willing to pay more for a clarified, aged tequila. The average price for a cristalino in Mexico is 30% more than its non-clear counterpart. In the United States, the price is only 16% higher. Is this a new category of tequila? Not officially. At this point, the best answer we can give is “kind of”. 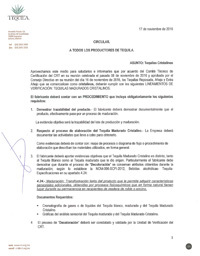 The Tequila Regulatory Council (CRT) permits cristalinos. In fact, at a Nov. 2016 meeting, the CRT’s technical committee laid down some standards for the clear, aged tequilas, without actually naming it a new category. Under the committee rules, producers must show documentation that the product was actually barrel aged, as well the process by which it was made clear. This is where it gets interesting—the committee said that these rules exist to show why cristalinos are distinct, like the categories of blanco and aged tequilas. What’s more, it says that the “de-colorization” process must conserve some of the aging attributes obtained in the barrel. So, over-filtering and completely stripping away the aromas and flavors created during their time in the barrel, is presumably not permitted. Cristalinos appear to be a curious in-between expression. Of course, we are further in our tequila journey than others, so maybe these would have been a nice entry point. But when we see them all over the Mexican market we worry a little that people will soon expect all tequilas to be so gentle and “smooth” that more traditional products could fall out of favor, or they will confuse them with what should be an agave-forward blanco. We’ll see! Have you tried cristalinos? If so, rate them in the app and let us know what you think! *These additives are permitted by the CRT, as long as they do not constitute more than 1% of the volume. But, additives these days are so advanced, it takes very little to completely change the aroma, flavor, and body of the liquid. Me, as a tequila maker, wont ever produce a cristalino tequila. No matter how atractive is the bussines, for me Will always more important to produce a tequila that makes me feel proud, and making “easy” drinkable, “sweet” and low alcohol tequilas is not a way to feel proud about something. Interesting article as usual, and very informative. I will never buy a Cristalino myself, but have tried many and dislike them all, especially Don Julio 70. Don’t we have enough “gateway” tequilas to hook people in, like the artificial tasting Casamigos and Clase Azul? Why make such a gimmick as Claros? I see it’s basically aimed towards Mexico, and how sad that the country that brought us this amazing spirit, with it’s wonderful traditions and history, would have people want this bastardization of their magical elixir. I am happy to hear Jaime say what he did. I respect his Suave brand of tequilas, and for a major Mexican Producer/Master distiller say this is refreshing. I hope more brands in Mexico will refuse to just cash in on this Gimmick. Clearly you seem to like the Volcan Cristalino quite a bit since you make reference to it several times. However, upon checking the Tequila Matchmaker community scores it is actually Revolucion Anejo Cristalino that gets the highest rating (91pts). Volcan (88pts) and the others mentioned in the second paragraph are noticeably well behind Revolucion. Curious to learn if you tasted that one and what you thought. Hi Adrian. We haven’t tried it yet, but have noticed it is the highest scoring cristalino on TMM thus far. Well, please let me add yet another angle to this article…or at least to the comments. Hopefully I speak for a yet unrepresented group. I have been a Tequila and Mezcal drinker for 46 years, in and out of 75% of Mexico. I put myself in a group of non-elitist Tequila drinkers who simply love Tequila and introducing it to others, explaining the processes, and generally imparting knowledge – kinda like true wine lovers, I guess. In many years I was never able to enjoy any aged Tequila, as drinking Tequilas aged in an oak barrel immediately hit my gag reflex as badly as Scotch. Since late 2010, when they launched ahead of their 70th anniversary, I have joked that Don Julio made their ‘70’ for me. I’m working my way through the “now fashionable” brands in this article and others, and I am extemely happy to have a whole new lineup to add to the 14-15 favorite Tequilas in my home bar. Scarlet and Grover – thanks to both of you for another thoughtful and informative article/report. It illuminates many of angles on the “crystalino” tequilas. Thanks again and we’re wishing y’all a very merry Christmas, happy Holidays, and the best of everything in this approaching year.